This week in the world of cartoons, the Teenage Mutant Ninja Turtles return from their Summer slumber! While the turtles return, a number of our favorites take the weekend off, but we still have plenty of great clips to show you! Regular Show, Avengers Assemble, Hulk and the Agents of S.M.A.S.H., Beware the Batman, and Ultimate Spider-Man are off this weekend. As always - minor spoilers ahead! Adventure Time - "The Box Prince"
Ever met a cat that used a cardboard box as a shell-like shelter? One such cat is the ruler of a small realm, the Box Kingdom. A pretender to the throne has taken the Box Prince's seat, so Finn and Jake step up to aid him. 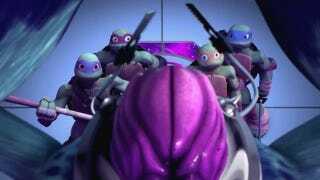 Teenage Mutant Ninja Turtles - "The Mutation Situation"
Season two kicks off this week, and our turtle heroes are battling not one, but three Krangs (or Kraang if you are referring to the species...) in this clip. The series really hit a stride at the end of season one - let's hope that pace continues. Legend of Korra - "The Sting"
Mako plays detective this week, as the firebender aims to uncover a devious plan to close the doors on Future Industries. Avengers: Earth's Mightiest Heroes - "Breakout"
Yes, this is an old episode, but all of the Marvel cartoons are off this week. Graviton, alluded to in this week's episode of Agents of S.H.I.E.L.D., makes a rare appearance in this clip. Dragons: Defenders of Berk - "Tunnel Vision"
Hiccup and Toothless find a system of winding caverns under Berk, but that is not all they find. The duo stumble upon some recently hatched Whisper Death stashed down below by Alvin and the Outcasts. Top image courtesy of Nickelodeon via a clip for this week's episode.